Be the first to share your favorite memory, photo or story of Fredrick. This memorial page is dedicated for family, friends and future generations to celebrate the life of their loved one. 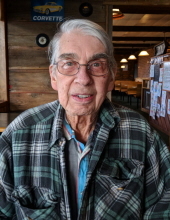 Fredrick G. Krieck passed away on January 10, 2019 at the age of 86. He was born in Portland, Oregon to John and Elizabeth Schipelhut Krieck. Fred was the 9th of 12 adult children, He had 7 sisters and 4 brothers; Frances Bowen, Clara Stahly, Kenneth, Donald, Genevieve Ephrom, Evelyn Pritchett, John Jr., Walter "Billy", Rose-Marie Stiffler, Isabell Higgs, and Ruth McMillin. He grew up in the Bonnie Slope area of Beaverton Oregon, and graduated in 1951 from Beaverton High School. He served in US Army, Stationed in Germany doing reconstruction and creating communications infrastructure. On June 9, 1953, he married his high school sweetheart, Marilyn V. Thompson at St. James Lutheran Church in Portland, Oregon. Their first home was in the garage apartment of Marilyn's family home. In 1956, they purchased a 10-acre farm in what is now known as the Murray Hill / Cooper Mountain areas of Beaverton. Fred continued work in the steel industry while raising various crops and animals. He also did custom hay and harvest work for small farm owners. In 1970, they relocated to a larger farm outside of Carlton. His vocations included: Journeyman Draftsman in steel fabrication (Fought &Co.), he worked for his in-laws at Oliver & Thompson Wholesale Florists (O&T) as well as Portland-area florists. He and Marilyn added to their busy holiday seasons creating holiday wreaths and garland for commercial sale. After Marilyn passed, Fred sold the farm and retired in McMinnville. He enjoyed fishing local lakes and streams and along the coast. His favorite being Town Lake in Pacific City, Oregon. Fred was preceded in death by his wife, Marilyn V. Krieck (nee Thompson), and 10 of his brothers and sisters. He is survived by brother, John Krieck Jr., children; Kathy Sitton (Allen C.), James (Susan M.), Susan A Krieck, and Chris (Grace), grandchildren; Allen N. (Kelly), Peter (Jenny), Emily Sitton; Joshua (Lenneal), Travis (Jessica), Miles Krieck; Robert Ritchie, Michael, Elizabeth, Evelyn Krieck, and great-grandchildren; Chase, James, Lincoln, Isaiah, Gabe, Kathryn, Brexten, Logan. A viewing will take place on Monday January 21st from 11:00am to 12:45pm at Macy & Son Funeral Home. Services will follow at 1:00pm, at the Chapel of Macy & Son, McMinnville. A private interment will be held at Yamhill Carlton Pioneer Memorial Cemetery. Memorial contributions may be made to: Beaverton Family & Alumni Network (13000 SW 2nd St. Beaverton 97005), Muscular Dystrophy Association, Spina Bifida Association of America (for Kathryn Krieck), or to the Yamhill County Chapter of Special Olympics. To send flowers or a remembrance gift to the family of Fredrick G. Krieck, please visit our Tribute Store. "Email Address" would like to share the life celebration of Fredrick G. Krieck. Click on the "link" to go to share a favorite memory or leave a condolence message for the family.